We've been back in school for a while now and it seems as though that great behavior from day one is starting to slip. 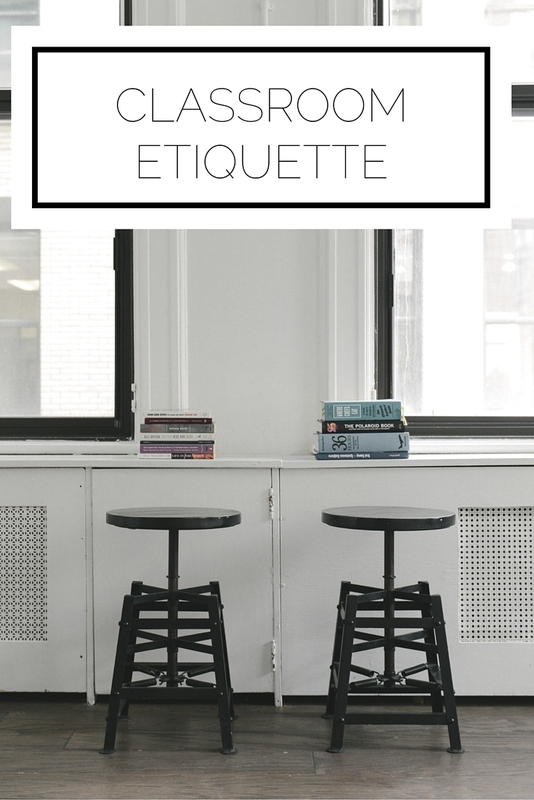 Today we're going to delve into the etiquette you need to know for class so that you have the best experience with your professors and fellow classmates. Ok, I know this is sort of harsh but I truly believe it! Coming to class exactly as it begins is cutting it too close. You need a few minutes to get to your seat, get your materials out, and have your mind in the right place to learn. When you come right on time or, god forbid, late, you disturb others and nonverbally tell your professor that you don't respect his time. In my experience a good rule of thumb is to arrive a solid 5 minutes in advance. With discussion based courses this is up for more interpretation, but generally speaking you should not speak unless you are called on or the floor is open. When you are participating in a discussion you must be sure to allow others to complete their thoughts without speaking over them and always conduct yourself in a respectful manner. By waiting a beat between someone finishing a sentence and beginning, you can ensure that they've fully expressed themselves and don't need to worry about interruption. Although you, my dear reader, behave properly, you may encounter others who don't know the rules of etiquette. If you are cut off or someone jumps down your throat, still let him finish but then say something along the lines of "I see your point and as I was saying before..."
When it comes to group projects, questions for your professor, or any interactions which may warrant further correspondence, be sure to do so in a timely manner. As we all know, nothing is more frustrating than waiting for confirmation that someone has done their part of a project, especially when your grade rides on it! The way you present yourself is a reflection of the importance you give to the task at hand, so the way you dress communicates to your professor how seriously you take your school work. Although it may be far more comfortable to come to class in yoga pants and a sweatshirt, put in the extra effort to show that you appreciate the professor, your classmates, and how fortunate you are to be pursuing a degree. What would you recommend keeping in mind for the classroom?